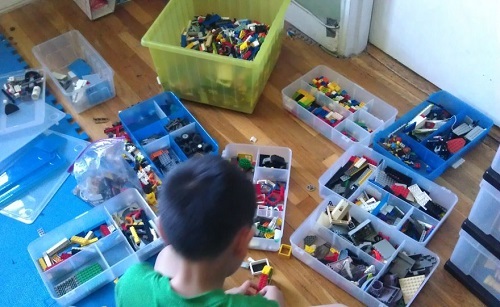 Did you think LEGO Mindstorms was the most challenging way to work with LEGOs? I did but not anymore! INVEST: Tickets: $17.50 (child 4-12), $22.50 (adult), $19.50 (senior 65+) If you don't live near NYC, no worries, look for more info below to find out if the Brick Artist is in your area. 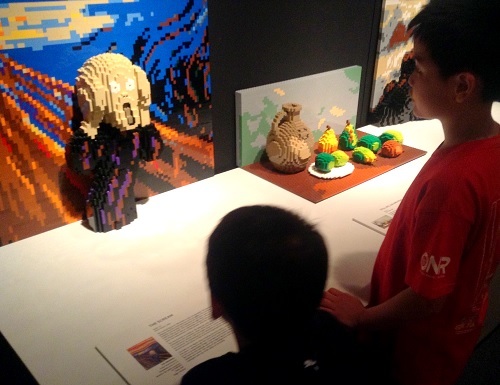 CONTEST INFO: Submit a photo of your child's LEGO creation to win tix (up to $135 value) and have their work displayed for all the world to see! (up to 40 creations) Read below for details. So I finally made it to one of Nathan Sawaya's exhibits! What a treat! The first thing I want to say is really a question. When you look at this, do you feel like this is a show for adults or for kids or for both? If you said both but think that a big yellow man with bricks coming out of his chest is not "art for kids" then I would say that I used to agree with you but, I don't think like that anymore. I loved this part of the exhibit. 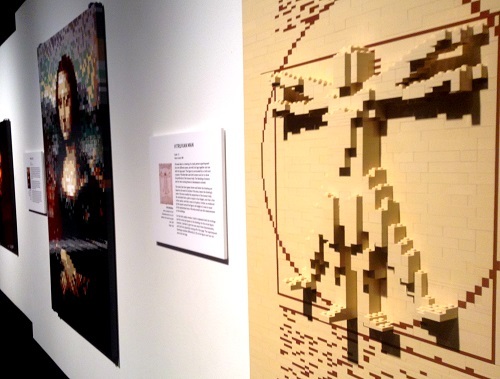 Famous painting remade into LEGO sculptures. This is American Gothic. The first part of the exhibit, we walked through sculptures of famous paintings in both mosaic and mixed 3D + mosaic form. What a gift to be able to share one of my favorite painting that I learned in Art History class. 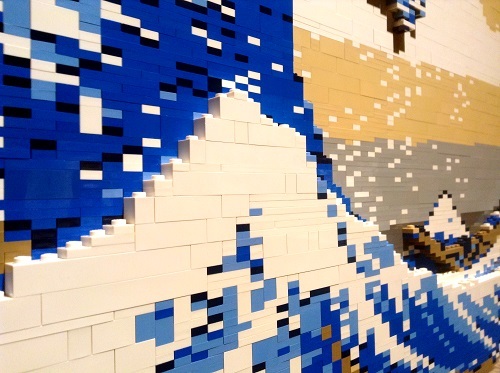 This is a brick representation of Hokusai's ukiyo-e style wood block print- The Great Wave Off Kanagawa. 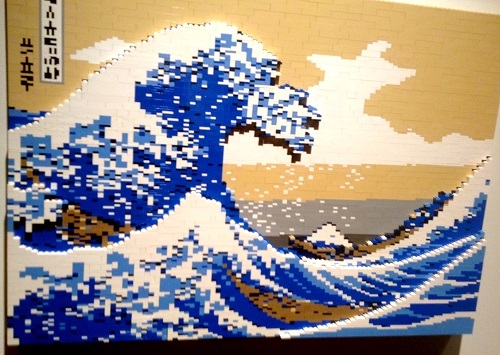 Looking closely at it, I don't know if I like Nathan Sawaya's more or Hokusai's more. 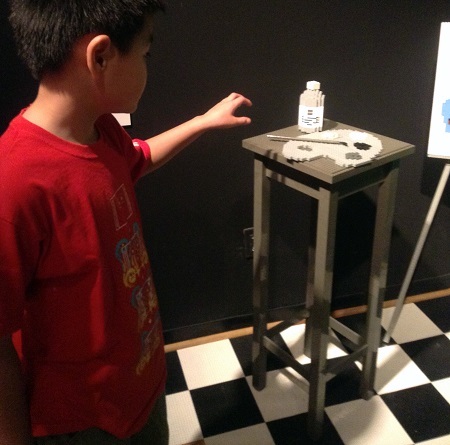 I tried to get my son to stare at it with me but he was much more enamored of the 3D sculptures. I was so worried before going in. Will my kid touch the sculptures (this is a no-no) and get us kicked out? 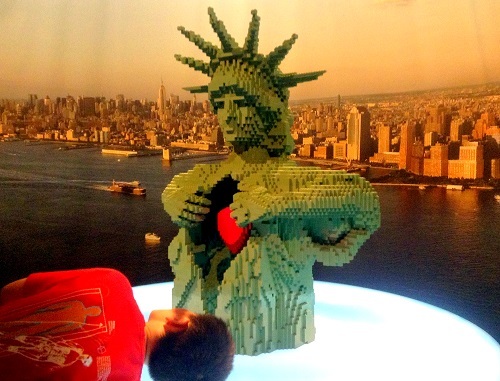 He might love LEGOs but would he love the sculptures? I was curious because even though he had seen Nathan Sawaya's work in photos before, it's not like he ever asked me to print out a picture so he can study it. 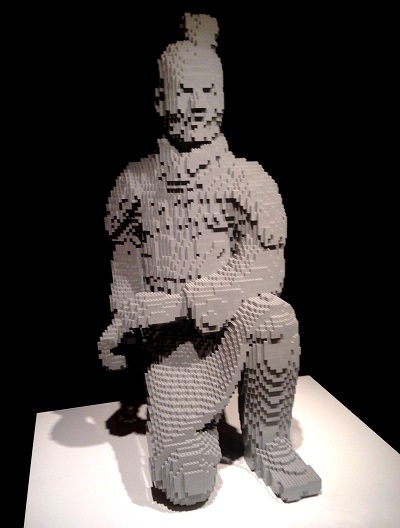 This all changed after viewing the Art of the Brick sculptures in real life. The photos have always been beautiful but there is no comparison to seeing it in person. I thought for a moment about just going alone since I can get more work done with less distractions. But that option made no sense. My kid is the reason I love LEGO bricks. 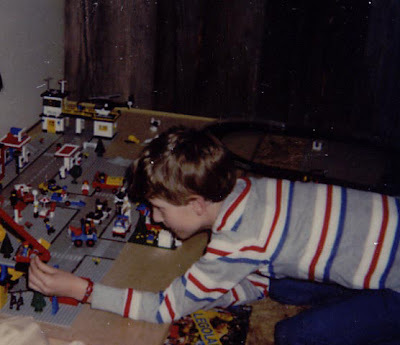 We would share this moment someway somehow and we brought another LEGO loving family with us. The result? It was a real learning experience on so many levels. I was really surprised. 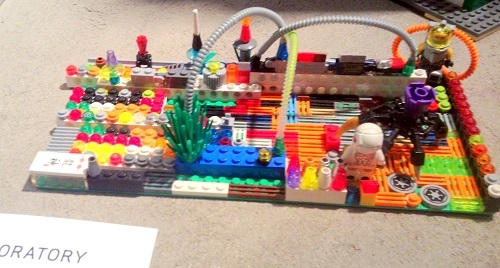 This whole table with palette and paint and paintbrush are all made of LEGO bricks. 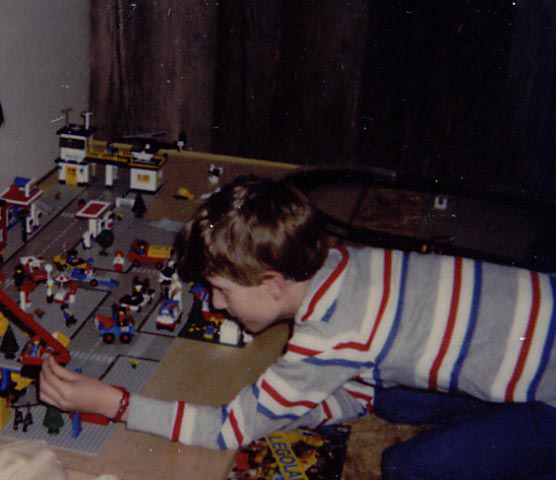 I wish there was one little table of LEGO bricks in a corner somewhere. It's really painful not to be able to touch any of the sculptures. 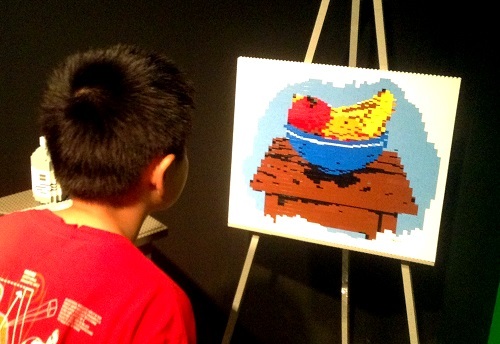 Using darker colored bricks make the bowl jump off the "painting." The kids are registering all of this. I just know it. I thought this might be scary for kids but the two nine year old boys didn't think so at all. I think it was all in my head. Like I said, I learned a lot. I learned about how kids appreciate art that is usually enjoyed by adults. I didn't even think about the fact that I never take my kids to art museums (you know, the kind that grown-ups go to- quiet, no touching...). If I do, it would be because we have signed on for a hands-on class for kids. 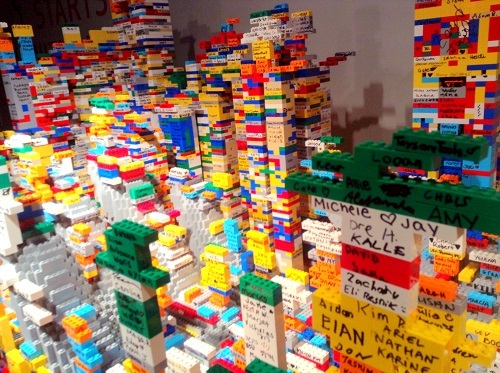 However, despite this being a LEGO brick exhibit, you are not allowed to touch anything. This can be a problem, so be prepared. 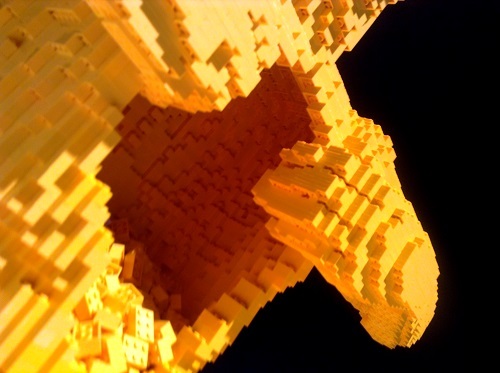 Luckily, there was a video introduction by Nathan Sawaya himself where, in a down-to-earth tone he talked about how he loved creating and even brought his LEGOs to college. 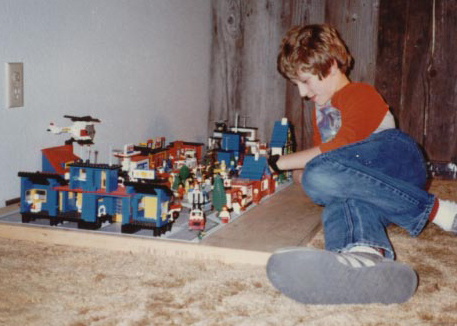 However, instead of becoming an artist, he became a lawyer but then later he became an artist using LEGO because it was fun and "no one else was doing it." He really brought the LEGOs with him to college. That's amazing and totally believable. His video introduction was very calm and friendly. It set a good tone for the kids before viewing. I can't tell you how nice it is to stand there and watch your child hear this because more than anything, I know that my son really wants to be original. It was nice to know that we would be seeing the work of someone who was like-minded in that sense. 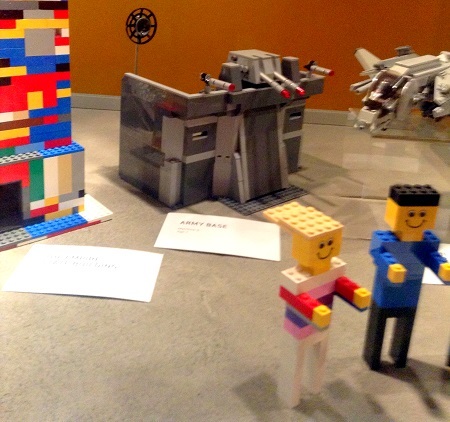 He also encouraged attendees to think about creating their own works of art by using any medium, not just LEGOs. I appreciated this advice since I was a little worried that my son would leave the exhibit asking me to buy him 1,000 yellow bricks. There is so much to talk about here. I wish you could buy a pass to Discovery Times Square so that you can pay a little more to see your favorite exhibits multiple times. It's a lot to take in all in one day. You'll find yourself wanting to tell them about the things you see but they are kids and so they can only take in so much. 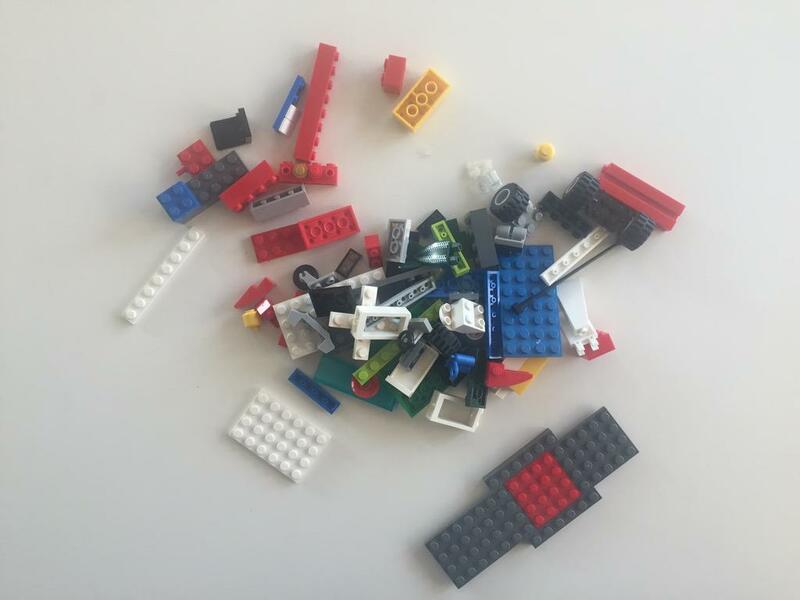 Disruptive Thinking with LEGO: Is this for Kids Only or Grown-Ups Only? The greatest thing about this exhibit is that both my son and I came in there sort of like equals in expertise. 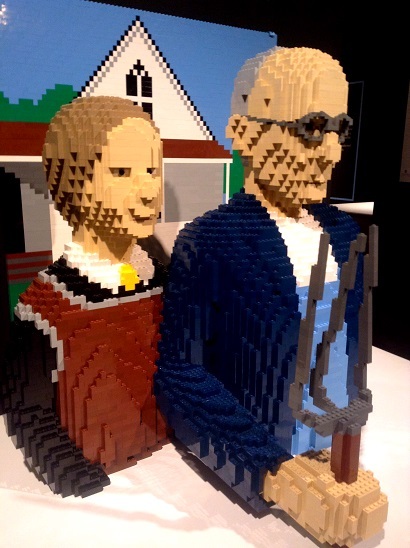 He knows LEGOs the best in our family but I have had more exposure to the world and to famous works of art. 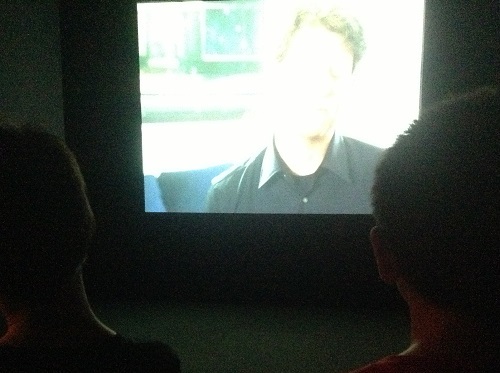 Thus this exhibit put us in an undefined place where neither of us knew the most. We weren't doing a "grown-up" thing but we weren't in a children's museum either. I don't think either of us knew how to "be ourselves" there. 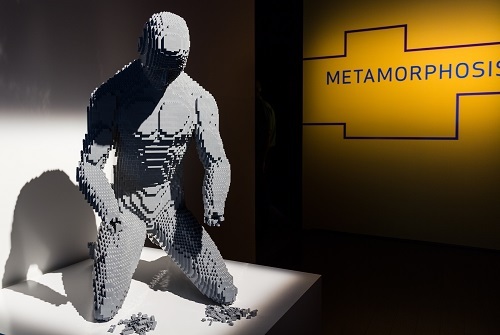 Perhaps that is what is most provocative of Nathan Sawaya's work, it disrupts your regular image of LEGO because you are looking at something you see everyday but in a totally different way. I wanted to figure out how to remember this moment with the kids and so I started observing them looking at the artwork and asking them questions. That was the coolest part! My son paid attention to details that I wouldn't have ever thought of. He was checking out the "holes." (cavernous spaces) I would have never thought to stare at that. He kept trying to peek inside the chest of sculpture Yellow. I was grateful because I got to know something new about my son. 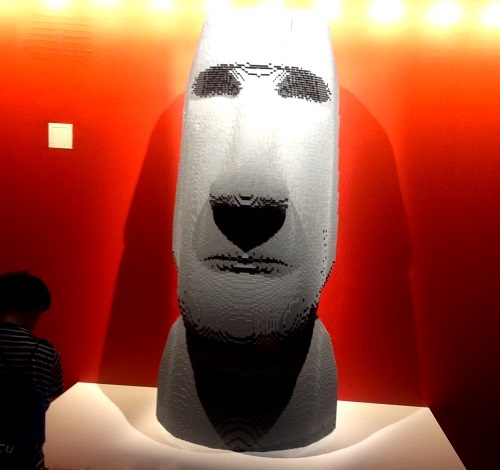 If Nathan Sawaya didn't use LEGO and used something like bronze or plaster, I doubt my son would have been examining it so closely. That's because LEGO bricks are part of his vocabulary- he's familiar with it. This is what I mean by thinking disruptively, you change one thing about the way things are done and then wow, new things, better things can happen! What is really cool about seeing renditions of famous works of art is to talk about it with them. I got to tell my son,"hey I saw the Terra Cotta Soldier Statues in Xi'an, China." He surprised me too. He actually knew what these were. Have you ever discussed art with them? 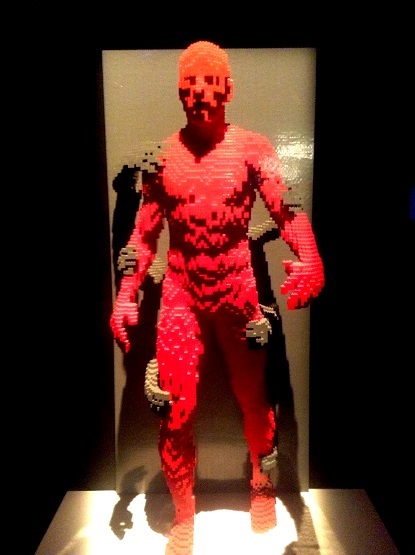 I didn't realize that I probably had never done so until we experienced The Art of the Brick together. So on this day, I gave it a try. I asked my son and his friend what they thought of the sculptures. Some of them are kind of not-kid-material so it was really interesting to hear what they had to say. They tend to wander and dart off and get silly but if you can stop them and show them that you are really curious about their thoughts, their comments are fascinating. I loved all of them. Me: Why do you think there are no hands? Son's Friend: It got chopped off. Me: Why do you think this happened? Son's Friend: It's because he wasn't looking the right way. Son's Friend: It got chopped off and he died. Me: You really think he's dead? Son's Friend: He may look like he's alive but he could be dead. My son's friend is quite the sage. A doodle artist himself, he told me that when looking at this sculpture, Yellow, he said thought that the artist was trying to say that everyone should open their hearts and be open-minded. 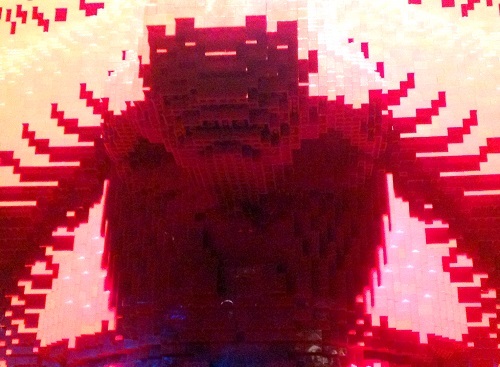 Nathan Sawaya explained that he took tons and tons of photos at all different angles to do this self-portrait. It took about a month to complete. Then I started thinking.. how did he manage to finish all these sculpture? Does he have an apprentice? Does he sleep? So sorry that I didn't have time to do an interview but I wanted to bring you this story while there was still time to enter the contest! Deadline: 8/19/13!!!!! Yes, he just had to look up to see the nostrils. Video is not allowed but non-flash photos are (just for this exhibit) so you can ask him to take a photo of his favorite things and take a photo of the description too. The descriptions are great as the artist leaves his thoughts and lists how many bricks were used. You can't remember all that info and with kids, sometimes you don't have time to read it. Making a photo journal of your fave pieces and your child's could help. 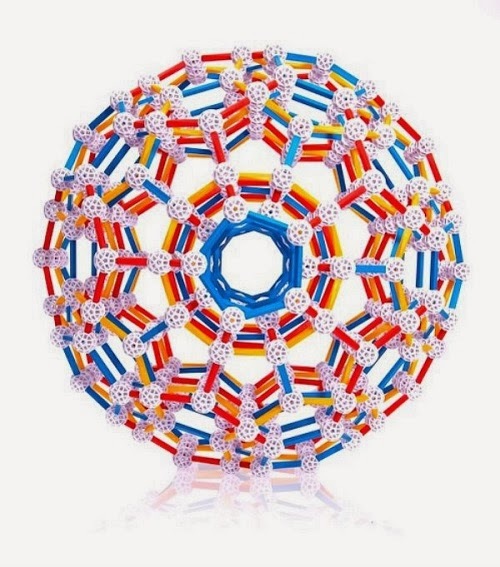 If your child must touch something, bring a fidget to hold so that they will feel less inclined to touch something. I actually bought my latest favorite fidget in at Discover Times Square. I'll post a pic when I can find the darn thing. It's a hit here. 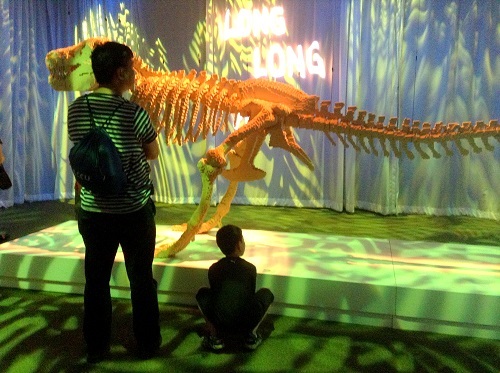 When you leave the exhibit, you will walk right into the store so if you are planning to buy something, you might want to use the "I'll buy you a little something at the store"-line as a reward for patience. There are lots of LEGO building ideas books too. 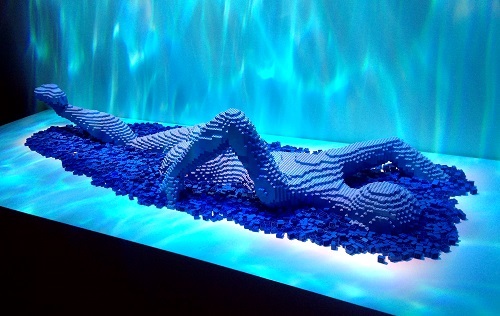 And of course, The Art of Nathan Sawaya is also available for purchase! I found coupons in Grand Central Station (tourist booth) if you feel like dropping by there. I would bet coupons are in tourist booths in Times Square. I think it was for $5 off. There are two other exhibits. Body Worlds: Pulse and Shipwreck: Pirates & Treasure were so different from each other. The kids enjoyed all of them. You're not supposed to touch the sculptures but the security folk were pretty nice and kid-friendly. I appreciated that since they are kids and they are curious. The one thing you can touch. The kids spent a lot of time admiring this. 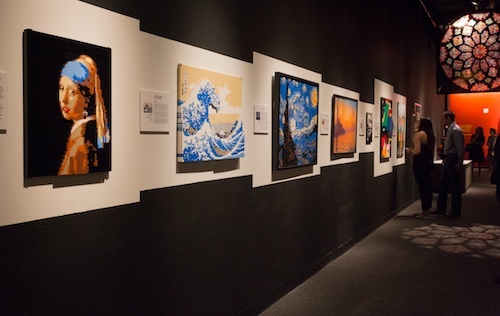 Obviously, a lot of people have come to see this exhibit. Made by kids. Could your child's be here next? This is titled "The Laboratory of Life" How cute! My son liked the army base too. 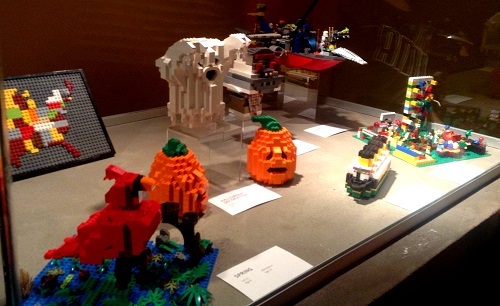 Is your child's creation the next to be displayed? 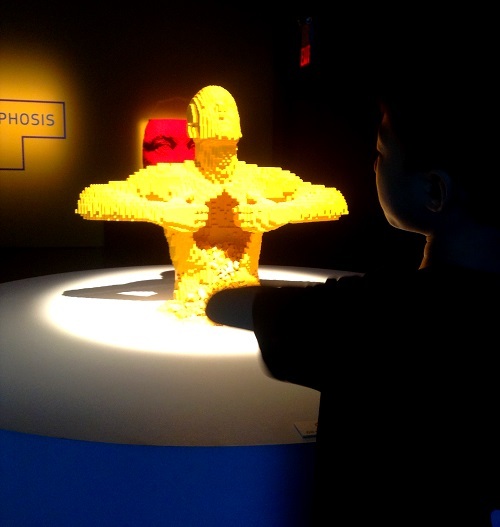 THE ART OF THE BRICK® at Discovery Times Square runs until January 5, 2014. Discovery Times Square is open seven days a week. Special savings for groups of 10 or more are available with advanced reservation. Once open, the last tickets are sold 60 minutes prior to closing. 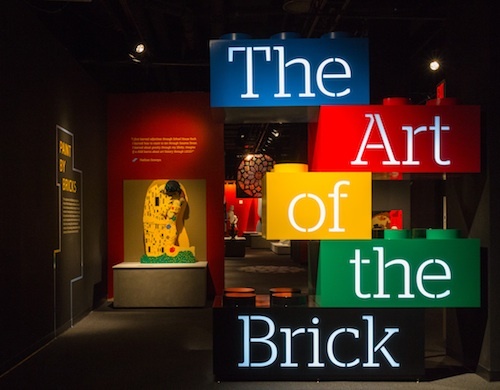 For individual tickets and venue hours, visit http://www.DiscoveryTS.com/art-of-the-brick, or call 866.9.TSXNYC (866-987-9692) or visit the Discovery Times Square box office. 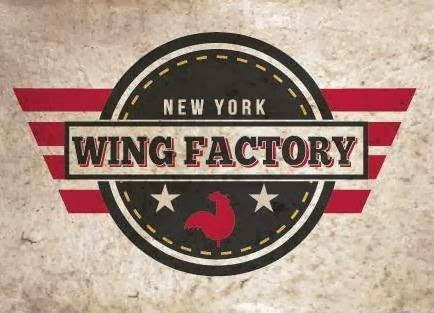 If you don't live in New York City and aren't planning to come by anytime soon, you never know... bricks may be coming to you soon. 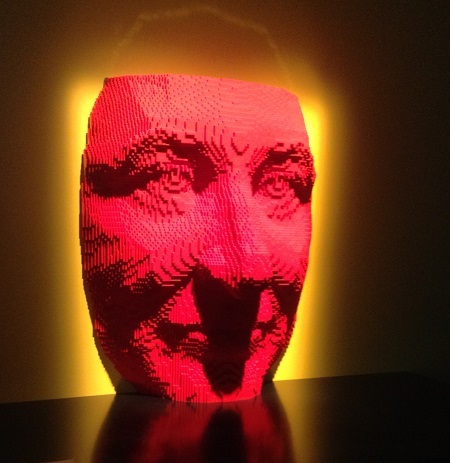 Visit Nathan Sawaya's website for more info. Photographs at Body Worlds are not allowed except for this horse and rider at the end. You would think the kids would be creeped out or silly but they were appropriately reverent. You just can't help but be quiet here. Shipwrecked was lots of fun too. So different from the other two. This exhibit was more hands on. Here is a hurricane simulator. You're not allowed to take photos here either but I couldn't help myself. Sorry!!!! They absolutely loved this part! They are looking to feature the work of 40 artists so your child could be one of those talented 40! Click here to get the details of the building contest! You can win 6 tickets too (value over $135!). Heck you can even enter too. 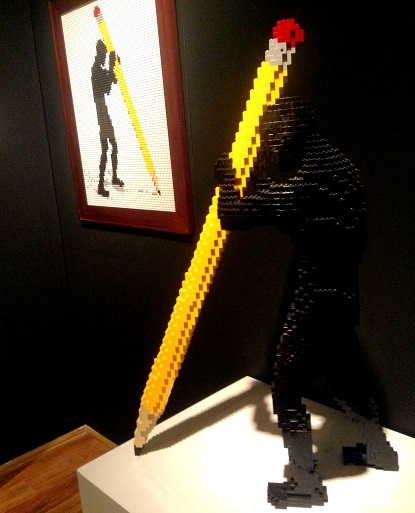 Nathan Sawaya's work is letting you know that even grown-ups can play with LEGO! Last day to submit your work (just send a photo) is Monday, August 19. 2013! Want to get Nathan Sawaya's book on Amazon? Feel free to use my link to support Toys Are Tools with no additional cost to you! Disclosure: Toys are Tools was not compensated by the exhibition hall for the publication of this review. Admission tickets were provided to Toys are Tools to facilitate a review. Reviews are never promised.